What is a Modern Fitting Shirt you ask? That is a question we get asked almost every single day. Let’s rewind a couple decades and go back to the 90s. During that timeframe, dress shirt trends were popular in the “Boxy” or “classic” fit. The overall shirt body was what they called relaxed, or classy fit and had very little inward curvature. The sleeves were also baggy from the biceps through under the armpit area. The chest and waist area on the sides of the shirt cut straight down with a slight curve on the entire bottom of the shirt. The neck size has not changed over the years, but the style has. The Sizing is measured from the center of the buttonhole to the center of the button. The sizes usually range from around 13″ to 19″ as the industry standard. The rule of thumb is that you need room for about 2 fingers between the collar and your neck for proper fit and comfort. The collar used to be a smaller, and entirely flimsy feeling when worn. Today a larger and more dominant collar is the standard and even the interfacing material makes a huge difference. We use two layers of one of the most expensive 2-ply woven interfacings in the collar to give it a super crisp look as it stands tall. We also use 2 layers of a different interfacing for both the collar bands to create body but keep it flexible enough to be able to bend smoothly around your neck. The sleeves themselves are more tapered under the armpits in the modern fitting dress shirts. When it comes to cuffs, there are 2 types. There are French cuffs, which were fairly small and not as stiff in the past. Nowadays the French cuffs are much larger in size and more stiff in the interfacing. Our French cuffs recess a little on the front to show the accent fabric on the inside. 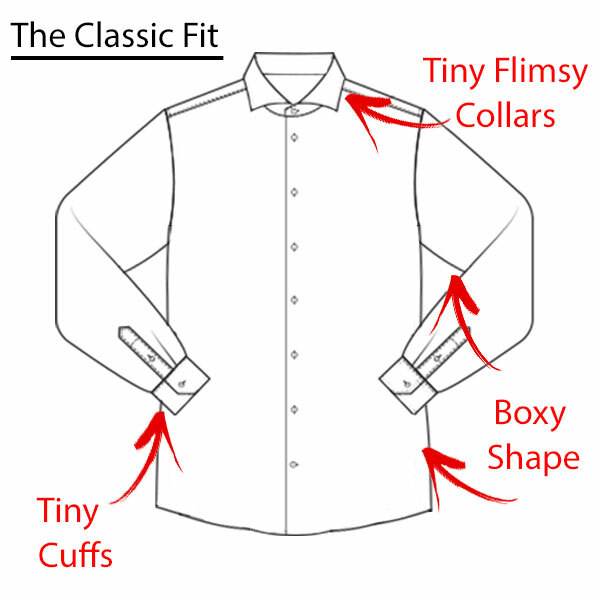 The barrel cuffs in the classic dress shirts were generally 2-2.5 inches in height and very flimsy. Today the modern fitting dress shirt barrel cuffs are much taller to 3-3.5 inches in height and with a woven 2-ply interfacing to make them much crisper. The modern fitting dress shirt body has changed through some trends. Back in the 90s and early 2000’s the shirt body was more of a boxy cut in general. Today they are much more tapered throughout the body, especially on the sides and in the armpits and shoulders area. The back yolk used to be very popular with pleats and now is smooth without any extra pleats or lines. The front pockets were in and out for the trends for the last 40+ years. Today the shirts with pockets are popular in the western style or the urban plaid style. A modern fitting dress shirt style can vary in many markets. Generally, a much more bright array of colors is more modern as well as cotton that is finished with a bit more sheen. Also, 2-ply cotton such as herringbone, diamond, or twill is really popular. Many prints for the main shirt body mixed with a paisley accent is a very popular combo. 10 years ago embellishments were very popular on the shirts including embroidery, rhinestones, and multiple fabrics sewn together. Buttons are a popular trend that adds to the detail. Having really neat buttons adds to the detailed accessorizing look. Lastly, contrast color stitching for topstitching, buttonholes, or button attach adds that extra touch to give the shirt a more modern look. A Modern Fitting Dress Shirt trend is also 100% American Made like all of our shirts. Shirts have been made all over Asia for many years. In fact, 97% of apparel is made overseas. The new trend is to make everything in the USA. Let’s not forget custom styling or design. Anytime you make anything in the USA, you can have a bit more flexibility in production volume and be able to make minor changes upon request. We charge no extra cost to be able to modify the fit or design.